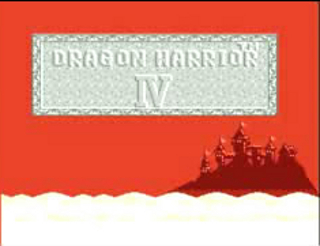 Released by Enix in 1992, Dragon Warrior 4 was the last installment of the popular RPG series to grace the NES. Featuring eight main characters, this was Enix's largest adventure to this point. Spanning five chapters and a huge world map for the time, the player must guide the heroes on a quest to save the world from the machinations of the villain Necrosaro. Best time: 4:52 by John 'Chessjerk' Kearsley IV on 2011-03-13, done in 62 segments. Welcome to my updated Dragon Warrior 4 speed run. Can the young heroine CJ speedily defeat evil and save the world with the help of her friends...again? We certainly hope so! Royal Soldier Ragnar must locate the missing children and rescue them. Easy, right? This is a very straight-forward chapter and doesn't require much explanation. Ragnar uses suicide warping and his running skills to avoid all enemies until he acquires the Sword of Malice, which he then uses to destroy all enemies in his path. The rebellious Princess Alena wants to escape her controlling father and go out adventuring into the world. Along with her supporters Cristo and Brey, she uncovers an unusual item, fights in a tournament to test her strength, and saves the Princess of Endor from an unfortunate promise. This Chapter has both forced level grinding and a tough tower with virtually unbeatable enemies. Fortunately, the late level grinding is accomplished by fighting Metal Slimes, which give excellent experience at the cost of being somewhat difficult to kill. Taloon desires to be the world's finest arms merchant, but he must start at the bottom, working in a weapon shop until he can get out on his own. This chapter is very important for reasons that don't become clear until chapter 5. Having a Sword of Malice available in the shop in which Taloon works is important to solving chapter 5's early money shortage. Also, leaving a Broad Sword in the cave for the Hero to pick up in chapter 5 makes the early chapter 5 battles much easier. Two sisters, Nara and Mara, are on a quest for revenge following the death of their father. Along the way, they are assisted by Orin, a friend of their father, who helps them in their journey. The sisters themselves are not too powerful, so getting Orin in the party as soon as possible is priority number one, since his strength and high HP are essential for a quick chapter completion. The young CJ, a descendent of the Zenithians, is destined to destroy the evil ones who are awakening to take over the world. But she is weak, and will depend on her companions (whom we met in the first four chapters) to grow strong and save the world. All of the characters from the previous chapters play a role in this incredibly long final chapter. First, Nara and Mara assist CJ in her early training. Then, Taloon is rescued and adds his enormous weapon collection to CJ's arsenal (for both use in battle and selling for money). Next, Alena's party joins up after CJ finds an herb necessary to heal the ill Cristo. Finally, Ragnar (who has been tracking CJ since chapter 1) finally meets up with the party and joins to assist the hero. There is some forced level grinding in this chapter, since CJ starts at level 1. Metal Slimes are available early on for some of the tough early chapter 5 boss fights. Later, one of the shrines is infested with Metal Babbles, the best source for experience in the game. Since only four characters can be used in battle at a time, the best lineup is CJ, Ragnar, Cristo, and Alena. Ragnar has high strength and HP and can use the best weapons and armor, but he is slow. Cristo is an overall above average character with great healing capabilities. Alena is only marginally weaker than Ragner, but she later equips a weapon that allows her to attack twice per round. She also has the highest critical hit percentage in the game, which is crucial for easy grinding and for many boss fights. The most important weapon in the game for CJ is the Sword of Lethargy, which is bought for her as soon as possible in chapter 5 and stays equipped for virtually the entire rest of the game. The reason for its excellence is its ability to put its targets to sleep. This ability works on EVERY enemy in the game, including the final boss. Only one boss has the ability to hurt the party while they are asleep, the rest of them are sitting ducks while they doze. Therefore, my basic strategy in boss battles is to put them to sleep and hope they stay asleep while the party slaughters them. It is remarkably effective. There are several major differences in this run versus the previous run. The main time-saver is the avoidance of random battles. In general, random battles should be avoided whenever possible, while running away as needed from battles that are encountered. There are two reasons for the avoidance of random battles. First, most enemies, when compared to Metal Slimes and Metal Babbles, give very little experience when defeated. Therefore, if leveling is needed, Metal enemies should be sought out instead of regular enemies to save time. Second, since this is a speed run, I am running through many areas of the game with both low levels and inferior armor, meaning that I couldn't fight the enemies if I wanted to without getting slaughtered. Another time-saver is the procurement of equipment. Generally, the weapon selection remains the same as before. However, much less armor is used in this run, since after much testing, I determined that many areas of the game can still be completed with sub-optimal armor and a little luck. The time saved from not buying armor and not accumulating gold to buy armor is significant. Finally, the third time-saver is the grinding. In this run, I grind using Metal Babbles much earlier than in the previous run. My higher levels at an earlier point in the game allow me to complete certain segments much faster.